Chillicothe Historical Society was organized April 6, 1971. Since that time, the members have worked diligently to further their stated mission – to preserve and perpetuate the history of Chillicothe and surrounding areas through written and oral history and related artifacts. The Society had a dream, a dream to create a permanent home for it’s numerous historical treasures and documents. 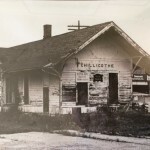 With some patience and a lot of persistence, in 1980, this dream became a reality with the acquisition of the 1889 Rock Island RR depot at Third and Cedar Streets. After much work, this building was dedicated as a museum on May 21, 1987. In August 1987, a 1929 Santa Fe caboose was obtained to display alongside the depot. Come wander among the reminders of railroading when it was young. The depot’s original interior is home to a treasure trove of Santa Fe as well as Rock Island railroad memorabilia. Kid and adults alike will enjoy the fully operational model railroad which chugs cheerily around the former baggage room, and is a delightful addition to this unique museum experience. Focused on its mission to preserve the history of Chillicothe and surrounding areas, the Society was rapidly accumulating artifacts donated by area residents. Renting the basement of the First Baptist Church to use as another museum space in 1987 helped immensely, but they soon outgrew the space. In 2000, the Historical Society, assisted through a generous monetary donation by a longtime Chillicothe family, acquired the 1928 Avery/Dr. Dolph house at 723 N Fourth Street. The Society had doubled its dream – two museums! The Society was indeed fortunate to obtain such a gracious setting to showcase its exhibits of period clothing, a vintage kitchen and old schoolroom, collections of unique Chillicothe business artifacts, military, local fire and rescue memorabilia, and much more. A third museum building, the “Cottage” out back – is home to Chillicothe’s rich river heritage, and contains exhibits of 19th and 20th century rural living and transportation native wildlife and local pre-history. Native American history, genealogy and a research department occupies part of the main floor of the main museum. Materials available for use include family histories, census records, plat books, county history books, cemetery records, area photos and more. The Society is proud to have historic photographs copied in organized binders for the public to view and examine, while safely storing the originals. Photos available include family photos as well as town, river, and rural views and activities. Quality copies of original photos may be purchased.